This post is authored by Anna Reyner, a registered art therapist and licensed marriage and family therapist. Anna is a nationally recognized arts advocate that has conducted over 500 hands-on art workshops for learners of all abilities. 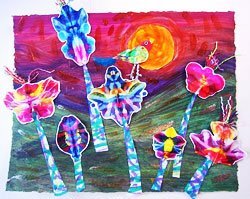 Follow Anna’s blog at Art and Creativity in Early Childhood Education. Summer flowers are in full bloom so it's time to be inspired by the brilliant colors of nature. 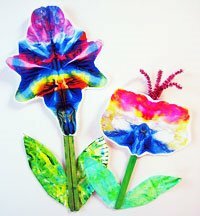 Children love making these simple fold-over flowers using brilliant BioColor®. Simply take white construction paper, fold it in half, and place dots of BioColor® along the middle of the fold. Re-fold the paper and press around the BioColor®. Open the fold and let the BioColor® dry thoroughly. Once dry, cut out your flower shape and attach a craft stick stem. Create leaves from additional construction paper or painted paper plates. Glue them together and enjoy as individual flowers. Or better yet, create an elaborate class mural and have everyone paint the background and then add their own flowers. You'll find lesson plans for both these ideas in Smart Art 2. Autism Society of America Conference Recap!